Lawn care takes time. What to expect. Grass cutting rules and advice. Large lawn, Paddock and Field cutting. Surrey Total Lawn Care offers grass cutting/ mowing service and contracts in the Surrey area. We specialise in grass cutting contracts for larger lawns, where our ride on mower comes into its own. We are able to maintain large areas with our professional equipment. Meaning the customer has time on the weekend to enjoy the garden rather than having to cut the grass. 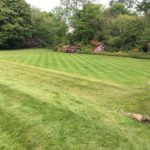 Our operatives will keep all the lawns cut to the correct height depending on the weather and the condition of the lawns. We can also add lawn care, patio/driveway cleaning and weed control into your package. We currently cover the Cranleigh, Guildford, Dorking and surrounding Surrey hills areas with our mowing team. But we are expanding all the time, so please ask if you are unsure to weather we will be able to help you where you live.